Anthrax (anthrax; synonym: pustula maligna, anthrax anthrax), acute infectious disease of the group of zoonoses. Etiology. The causative agent of anthrax - large wand capable paroobrazovaniya when the access of oxygen; outside the animal organism disputes stable and can persist for years. Vegetative forms less stable and quickly die. Epidemiology. The main reservoir of infection - large and small cattle. The pathogen penetrates into the human body in different ways: through the skin, mucous membranes of the respiratory tract, gastro-intestinal tract. Infection is possible when using the coats, hats, fur mittens, if they are infected with pathogens of anthrax, when the butchering carcasses and meat of sick animals, and also in the use of poorly cooked meat of sick animals. The incidence of anthrax has a pronounced professional character. Often affects agricultural workers (herdsmen, shepherds, milkmaids and others), as well as the employed in the processing of animal raw materials (leather, wool, hair, sheepskin and others). 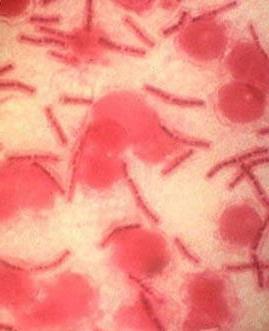 During the years of Soviet power anthrax in the USSR eliminated as a mass disease. Pathogenesis and pathological anatomy. In the pathogenesis occupies the leading place defeat of vessels with a sharp increase their permeability and development in organs and tissues serosanguineous inflammation. Typical regional lymphadenitis and lymphangitis. Develops intoxication. From lymph nodes of the pathogen enters the blood circulation. The generalization of infection leads to secondary gemorragicescom-necrotic foci with subsequent development of sepsis. Severe symptoms of intoxication are marked in pulmonary, gastrointestinal forms of anthrax, specific hemorrhagic meningoencephalitis, primary meningitis. On a place of introduction of infection occurs anthrax anthrax, which is a conical focus serosanguineous inflammation with necrosis of the surface layers of the skin, pronounced tissue edema and education brownish-black-peel, reminiscent of coal. Intestinal form of a limited or diffuse inflammation of the small intestine with the development of necrosis and ulceration, education effusion in the abdominal cavity. For pulmonary forms characterized by the development of hemorrhagic tracheitis, bronchitis, serosanguineous pneumonia. In the blood and internal organs show a large number of pathogens of anthrax; especially around blood vessels.